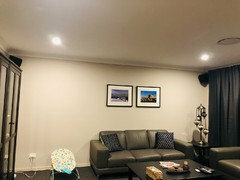 Looking to paint the back wall as a feature wall but don't know which colour will suit best, we have got dark grey carpets, dark grey curtains and black brown furniture, I don't want to overly darken the room, it my formal living room and the first room you see when you walk in the house. photo is attached. I don't think a feature wall will improve the room. 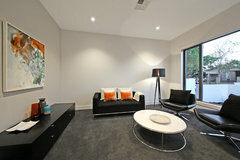 Feature walls are now so common place that they are no longer really a "feature". 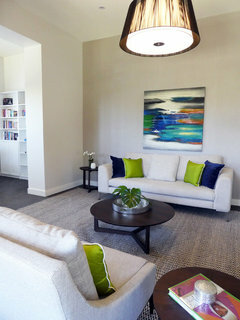 I would be looking at relocating your two pictures which are poorly proportioned for the size of the wall and hanging an oversized mirror above the couch which will add visual interest, and bounce some light around. Wow that’s really a great looking living room. Thanks for Dr Retro for the suggestion. That’s right the pictures are quite of place there. I definitely like the idea of a mirror. Further to Dr Retros comments above, I would also look at balancing the furniture placement and adding a floor lamp on the left side. You could also look at wallpaper options in a texture in a light colourway to give this aspect more interest.